Hello and welcome to Part 2 of The IDP Guru's 2012 IDP Rookies to Watch Series. Part 2 will be the final installment of the series and will cover players 11-20. Obviously, this list isn't all inclusive and there are a lot of potentially viable fantasy prospects that aren't covered. With this said, feel free to reach out with any questions you may have about this year's rookie draft class. These rankings were compiled with a primary focus on redraft leagues although there are some players in this list who are more of long-term prospects (e.g. Sean Spence). Hopefully, this will serve as a decent guideline as you attempt to navigate through the treacherous waters of this year's rookie drafts. Good luck to all! 11. WLB James-Michael Johnson (CLE) - JMJ is one of the best deep sleepers of this IDP class. He landed in Cleveland where outside of D'Qwell Jackson there isn't much young competition. He tends to overreact on plays at times and gets caught out of position, but he's fairly solid in coverage and has an outside chance of snagging an every down role sometime this season which is more than you can say about most rookie IDPs with his current ADP. 12. OLB Melvin Ingram (SD) - As my friend the good Dr. Jene Bramel has stated, Ingram "looks like a fire hydrant, but moves like a running back." The San Diego landing spot is a good one for Ingram as he figures to be more productive as an outside rush linebacker than a guy he puts his hand in the dirt. He's already secured an every down starter role opposite Shaun Phillips and should have better than expected upside in big play leagues. 13. OLB Courtney Upshaw (BAL) - The Ravens got a steal when Upshaw fell to them at the top of the second round. From a technique perspective, there weren't many better than Upshaw in this draft class. He fits extremely well in the Ravens system and will take on the Jarrett Johnson hybrid LDE/SOLB role. It may take him several games to nail down an every role however, so temper your expections somewhat early in the season. 14. LDE Shea McClellin (CHI) - Although McClellin isn't the greatest fit as a 4-3 end, but the Bears were desperate for a suitable plug in opposite Julius Peppers. The 1st round draft pick out of Boise State will start the season in a rotation with veteran Israel Idonije but should see his snap count increase as the season progresses. Although undersized, he's an underrated pass rusher and should see a lot of isolated matchups. He's likely to see the 2nd most snaps for a rookie end this season behind Andre Branch. 15. ILB/OLB Dont'a Hightower (NE) – Hightower is capable of playing inside or outside linebacker in both a 3-4 or 4-3 style of defense. The Patriots switched between both styles last year and most figure them to do the same this season. With this said, Hightower most likely will play SLB in the 4-3 and an outside rush linebacker in the 3-4. He's been impressive in practice and has had his moments during preseason games. Outside of Jerod Mayo, the Pats may not have another every down linebacker however which limits Hightower's upside. 16. S Brandon Taylor (SD) - Taylor is an all around underrated safety. He can play both safety positions and will likely be playing at strong safety next to Eric Weddle sooner rather than later. He just has to beat out Atari Bigby which shouldn't be that difficult. Although the safety position, isn't one of the best to use a draft pick on in dynasty leagues, Taylor could prove to hold his value quite well. 17. OLB Demario Davis (NYJ) - Davis played outside linebacker at Arkansas State and has drawn comparisons to Ray Lewis for his on-the-field tenacity and leadership skills. He's a great fit for the Jets defense and should be a great replacement for Bart Scott. He likely won't see much playing time in 2012, but if he does, watch out. With time, he could develop into one of the better inside pass-rushing linebackers in the league. For those in dynasty leagues, Davis is closer to a top 10 selection. 18. ROLB Bruce Irvin (SEA) – Draft analysts and viewers alike were shocked when the Seahawks reached for Irvin with the 15th overall pick in the draft. Off-the-field problems aside, Irvin has a lighting quick first step and could wreak havoc early in his career albeit in a limited basis. He's still quite raw and will likely only be featured in passing situational subpackages. For those in big play leagues, Irvin is worth a look as a LB4+. Otherwise, leave him be except in deeper dynasty leagues or leagues that classify him as a DE. 19. DT Fletcher Cox (PHI) - Cox was one of the most versatile and NFL ready defensive linemen to come out of this year's draft. Philadelphia will likely use him as a three technique DT and he could also see some snaps at defensive end. Look for him to contribute immediately to fantasy teams in DT-required leagues. 20. OLB Sean Spence (PIT) – Spence may be the furthest away from immediate playing time of anyone on this list. However, his long-term value is too big to ignore. The Linebackers have a strong history of producing top notch fantasy linebackers and you have to believe Spence will eventually follow suit. 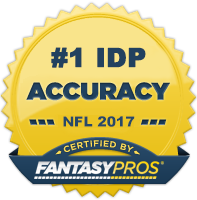 Great late round pick for those in deeper dynasty leagues.